I tried very hard to get a picture of Paul running with Pierce. Only it turns out it's kind of hard to take pictures AND run at the same time. In fact, I became a bad driver, and twice crashed into him. Which resulted in Paul sprinting up ahead to try to get into a safe zone. 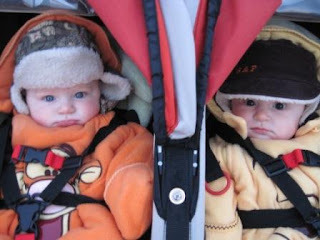 Today we're getting a little break in the weather, so I'm looking forward to taking the boys to the park. Pierce is so excited he already got dressed! He even put on his snow boots (on the wrong feet). Wonder what the chances are of me getting him to switch to tennis shoes? Too cute. And too funny about running AND taking pictures. I can't even run, let alone do both at the same time!!! I'm e. (you entered a giveaway on my blog). 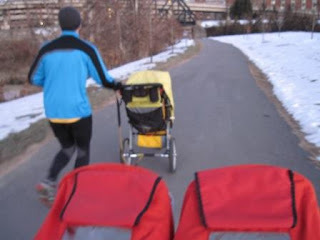 I noticed that you like to run, and was wondering if you've ever checked out marathonmommies.blogspot.com. It's a good place to exchange running stories. A friend of mine runs it and we're always looking to add new moms. Cute boys, by the way.